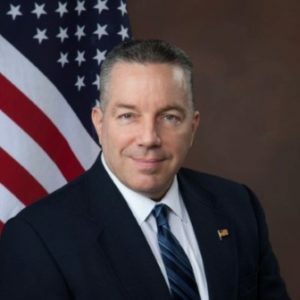 LOS ANGELES – In a confrontational surprise appearance Tuesday before the Los Angeles County Board of Supervisors, Sheriff Alex Villanueva defended his reinstatement of a deputy fired after allegations of domestic violence and stalking. Villanueva said there were a half-dozen similar cases that he planned to share with the board behind closed doors. “When you hear the details of the cases, you’re going to have a change of mind,” the sheriff told the supervisors. Supervisor Kathryn Barger had brought a motion recommending that the board send a letter to the sheriff citing “grave concerns” over the reinstatement and Villanueva’s comments to the Citizens Oversight Commission justifying his decision. Villanueva said his comments were misrepresented, but insisted that the facts did not support an allegation of domestic violence, going so far as to object to the board using the term victim. “We could safely call her a complainant,” the sheriff said. “None of us is so independent that we can do anything we damn well please,” she said. Kuehl said that any other county employee would have go to court to be reinstated, but Villanueva countered that he was aiming to save the county money by using an internal process to re-litigate cases. Villanueva countered, “I do care about the victims of domestic violence and I will do everything in my power to make sure that their voices are heard” and perpetrators brought to justice. However, he alleged that the Civil Service Commission has ignored “a mountain of (exculpatory) evidence” in some cases. Citing a six-fold increase in terminations, Villanueva said it had been “politically expedient to have a high body count” related to deputy misconduct during Sheriff Jim McDonnell’s tenure. Both Kuehl and Barger said the commission most often settled cases in favor of employees, citing an in-depth review of cases. Speaking to City News Service outside the hearing room, the sheriff said it made sense to get wrongfully terminated deputies back to work quickly and would consider cases dating back to roughly 2013, when he lost confidence in the process. While he’s setting up a “truth and reconciliation” team to consider wrongful terminations and wrongful convictions, Villanueva told the board he would move to reinstate deputies involved in the most “egregious” cases. Going forward, “the Civil Service Commission is not going to come across cases where we haven’t met the preponderance of evidence standard, they’re going to be black and white,” Villanueva said. He plans to share those cases with the Board of Supervisors and said the reinstated deputy was willing to waive his rights and share his entire personnel file with the board. The Los Angeles Times reported this month that Caren Carl Mandoyan was fired in 2016 by then-Sheriff McDonnell after a fellow deputy alleged Mandoyan grabbed her by the neck, tried to break into her home twice, sent her harassing text messages and admitted to listening to her conversations. A county appeals board heard evidence in the case and upheld Mandoyan’s dismissal. Barger said the appeals board vote was 5-0. Mandoyan, who appeared onstage at Villanueva’s swearing-in, served as his driver and played a key role in persuading rank-and-file deputies to rally behind Villanueva’s longshot — and ultimately successful — bid for election. Mandoyan will be entitled to back pay, according to the sheriff. Kuehl said there is a bigger issue at stake than Mandoyan’s innocence or guilt. “The larger question really is the public trust, the trust of this board, and perhaps it would also be good for you to take into account the trust of our contract cities,” she told the sheriff. Cities that contract for law enforcement services with the Sheriff’s Department are concerned about liability related to prior misconduct, Kuehl explained. The board asked its lawyers to request Mandoyan’s personnel file and Barger said she wanted to allow his accuser a chance to redact information. The board also asked county counsel to report back in two weeks on how to settle a conflict between the board and sheriff. “This is going to be one of many discussions we’re going to have,” Barger said. 4 comments for "Villanueva stands ground on deputy reinstatement"
Hmm I believe there is something called “innocent until proven guilty” in a document somewhere in our history……. Please point out where employment decisions are determined in courts of law using legal standards. The guy was fired because his employer was given a credible report of his behavior, and that behavior was deemed to reflect poorly on that employer. Because the employer was a county agency, that decision was forwarded to a review board, which agreed with it. Now the newly elected sheriff is overturning that decision. He isn’t presenting new information to the review board to justify a new course of action. He doesn’t even really claim that there IS ANY new information. Guess what…that’s most assuredly wrong, and since it is a county agency his arbitrary decision in defiance of the review board’s findings may actually be illegal…though that would be for a court to decide. This is worse than Lee Baca… Lee Baca pretended he did not know…. This guy not only knows, but thinks he can circumvent well known policy amd procedure.